Thomas Fey has earned himself a reputation as one of the most distinctive interpreters of the Viennese classics. He studied piano and conducting at the Heidelberg-Mannheim Conservatory and the principles of historically authentic performance with Nikolaus Harnoncourt at the Mozarteum in Salzburg. He also participated in conducting classes with Leonard Bernstein at the Schleswig-Holstein music festival. When still a student he established the Heidelberg Motet Choir (1985) and the Schlierbach Chamber Orchestra (1987), from which the Heidelberg Symphony Orchestra evolved in 1993. For many years now, international music critics have acknowledged all these formations to be among the leading proponents of an historically informed style of performance. In 2003 Thomas Fey founded the LA PASSIONE ensemble, a baroque orchestra performing on original instruments. In the same year it made its debut at the eponymous LA PASSIONE music festival in the Rhine-Neckar region of southern Germany. Also in the same year, and in anticipation of the Mozart anniversary in 2006, Fey established the Mannheim Mozart Orchestra, which made its first appearance to great acclaim on 27 January 2006, exactly 250 years after Mozart’s birth. Hundreds of engagements have taken Thomas Fey and his ensembles through the length and breadth of Germany and Europe, as well as to the United States and South America. Many of their CD recordings, including almost 30 symphonies by Haydn, Mozart, and Beethoven, have received international music awards. 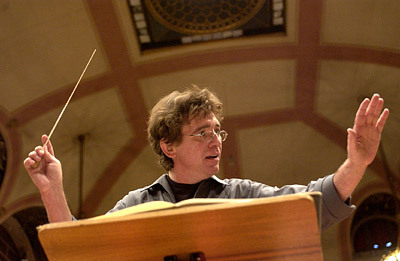 Thomas Fey’s repertory extends from Bach to Brahms. As an interpreter his interests center around the symphonies and concertos of the Viennese classics, but he is equally at home with the music of Handel, Rossini’s overtures, and the great waltzes by Johann Strauß. Thomas Fey had a tragic accident in 2014. Due to consequenses he will not return on stage. The orchestra members would like to express they gratitude to Thomas Fey for founding the orchestra and for his relentless work. We wish him all the best on his way to recovery.